This LO was done as a finished project for my corner punch circle border tutorial I did. I'll be posting the tutorial shortly but I must just give a shout out to my dear friend Lisa Gregory who was kind enough to allow me to use her idea.......You're the best Lisa and THANKS!! This is one of my favourite pics of my youngest two and they really are little rascals...LOL!. I used my gorgeous vine which I bough a while ago from KatiesKreations4U.com. She doesn't make the individual vines anymore but still has some geat kits. I altered the number (previous tutorial posted) with some alcohol inks and ribbon. This is a LO I did for the Back to School call. I tried doing a multi-pic LO but I'm really no good at them...LOL! These are just pics of my some from Grade R, Grade 4 and this year Grade 7. Boy, does time fly!! I used one of my fellow SNR staffer Lucy Chesna's sketch for this LO together with the Bella Vollo Swirlydoos kit. I absolutely adore the colours of this kit and the Gabrielle Bo Bunny papers.....YUMMY!! 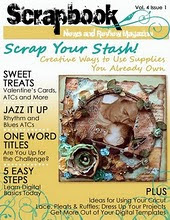 This was another LO done as a finished project for a tutorial on using lefyt over chipboard to create borders. I'll be posting the full tutorial shortly. Thanks for stopping by and keep a look out for some of my tutorials which will be posted at regular intervals over the next couple of weeks. Hi Wendy! It's SO good to see some of your work here again! Fabulous pages! I can't wait to see your new tutorials!